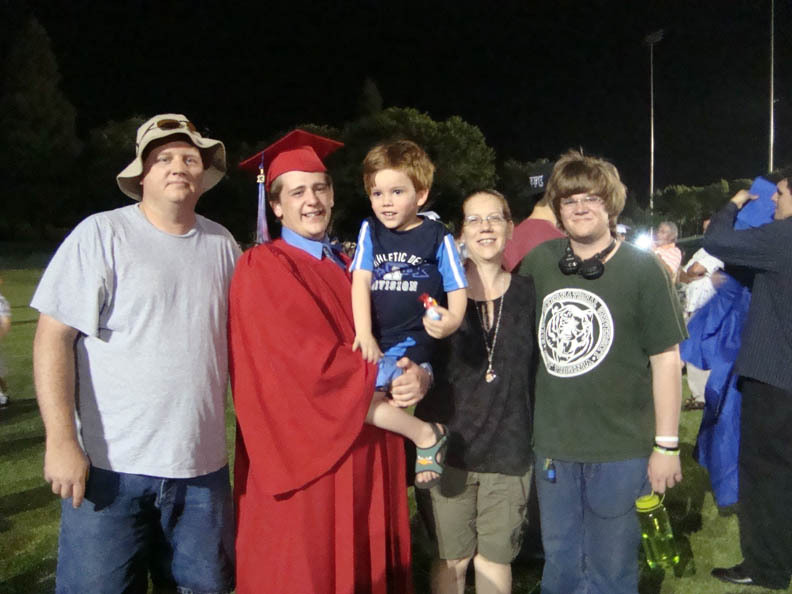 Last Tuesday, my oldest son graduated high school. I am so proud and excited for him – although like most parents I hold my breath just a little as he begins his transition into adulthood, meaningful responsibilities, and accountability. College is all lined up for this fall and he’s working hard over the summer to balance two jobs, some downtime with great friends, and creative projects. 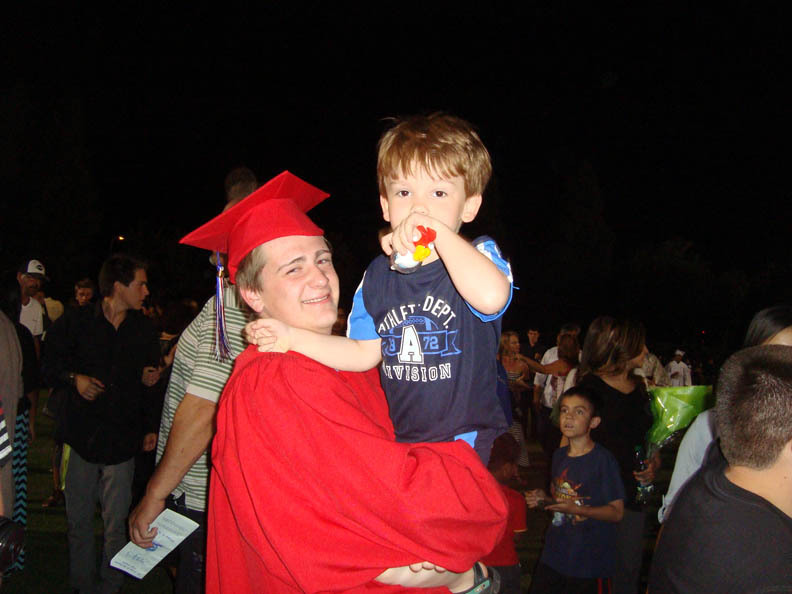 Despite my overfilling pride for CJ’s accomplishments, there was a small part inside that feared the requisite traditions and events – the graduation ceremony, party, crowds, and temporary changes in routine through my youngest child’s eyes and with the all-encompassing veil of Autism. These were not Autism-friendly functions, and yet, I was not about to miss CJ’s special moment. So, I did what I do best, and got down to the business of writing social stories, sharing YouTube videos, discussing expected manners, and more for the weeks leading up to this special day. Yet, for all the preparation in the weeks leading up to this event there was nothing I could do to prep my little guy for those times when the adults break the social rules – sending my W into overload at hyper speed without the logic, order, and calm he craves. It’s true that all parents possess a huge responsibility in teaching our children how to behave well. It’s also true that both typically developing and children with Autism must overcome challenging behaviors in a variety of social scenarios – but life on the spectrum presents a real landslide of unique and often misunderstood experiences. Our children’s needs are diverse as the million-billion snowflakes in a blustery winter snowstorm! With my son, we cope with sensory dysfunction on a daily basis – this means that he experiences life differently through his senses. Some things that seem normal volume to many people are excruciating for W. Too much visual stimuli results in an overwhelming brain fog and desire to run away and hide from the offending sensory input. His body needs movement to regulate his senses when overloaded. This is simply not possible at some events. Combine the sensory challenges with communication delays, OCD, and anxiety and I’m sure you begin to understand the level of predictive thinking I must employ to arm him with the coping skills necessary for something as socially challenging as a graduation ceremony. I’ve written over 50 stories for my little guy over the past three years. We practice and learn social skills through role playing, creative floor time, and even sharing educational videos or iPad apps. These are not measures that most parents of typically developing children must initiate. In hindsight, I regret not wearing my boldest Autism regalia to perhaps generate a little more compassion and awareness to those surrounding us in the stands. Maybe I would’ve avoided the ogling stares, hushed discourse, and aggravated harrumphs that we encountered with each trip to the restrooms. Has no one else attended a public event with a preschooler-in-potty-training?! Would these individuals prefer I sit still, clean up any resulting accidents right in the stands, and simply let my son scream out in protest at inopportune moments (like the Valedictorian’s speech) while engaging in self-injurious behaviors that draw even more of the above split-second judgment? We were in high alert before we ever found a seat. Too many people were pushy and rushing, which resulted in both me and W getting jostled about on the way to the entrance. There were air horns, and whistles, loud uproars, and much stomping. Ten minutes into the event, my youngest turned to me and said, “Okay, I’m done with the graded-i-cation. Now let’s go home.” I distracted him with snacks and encouraged him to cover his ears with hands when the noise became too much, but it wasn’t long until we began our many trips to the restroom – part escape and part functional. I can’t complain when he’s actually going potty each time; so it’s unfortunate that our row didn’t have a little more consideration for a young child that was rightfully overwhelmed and coping the best way they knew how. There was actually one man toward the end of our row that gave me a nasty look and refused to move his foot tripping my four year old. W got a nice scrape on his leg. This guy did this to us on two trips to the bathroom. While sitting there with his wife and younger children. I wish I’d stepped on his foot now – I wish I’d stepped hard and aimed right for his little pinky toe where it would be certain to hurt! What a jerk! Way to live with a kind heart…but I digress. At one point, my W bit down on his lips until they became bloody as he looked at me with tear-filled eyes asking me if we could go take a break away from this ceremony. I scooped him up and away we went – our fifth trip through the crowd. There weren’t many quite spaces to find, so we secured a little corner tucked a bit away from the bathroom. I sat down with him, criss-cross-applesauce, and took a deep breath myself. I was sad because I thought after all this chaos, I’m going to miss seeing my CJ get his diploma & do the walk across the stage. W and I talked about the crowd and noise and even the mean man. He asked me why no one was following the house rules – why they didn’t have quiet mouths? I could not satisfy his desire for a logical answer – in his world adults make the rules, establish the norm, and are dependable to uphold this routine. Today, the adults were unruly and loud and some were outright rude. He asked me how we get back home from this ceremony that he did not like. Overall, we made it through the entire ceremony – even fighting through the thick, elbow-to-elbow crowd to congratulate CJ after the event! I was sweaty, exhausted, and strung out from my diversionary work, but we made it and without having to leave early or go sit in the car. (I owe a big thank you to W’s oldest brother Jeffrey for his awesome shoulder ride to our destination!) Luckily, I did get to return to the stands in time to see my son receive his diploma and to my surprise, actually enjoyed the fireworks display at the ceremony’s close, which totally changed Mr. W’s mood from overload to happy. What have I learned from this experience though? No matter how I try to prepare my son, there will always be the presence of the unexpected. There will always be stares and snapshot judgments based on appearances alone, and the next time I will be certain to step on that a-hole’s pinky toe – so that I don’t sit stewing on the matter for over a week and a half. We need to get out of default mode and open our hearts to a more generous form of understanding and compassion. If 1 in 88 children, or 1 in 50 as updated by a recent CDC study, are diagnosed on the spectrum than we have no choice but to appreciate the different and diverse perspectives within our society. Please, the next time you’re at the store, some public event, or even on an airplane and you find yourself lapsing into a split-second judgment of your own – try first, to consider the deeper truth that may be present. Try to offer compassion and love instead of critical stares or comments. Give that Mom struggling with a crying baby a knowing smile – remember when your own were itty-bitties, too. Offer a welcome, yet friendly distraction to the overwhelmed child and genuine understanding to their Mother or Father. 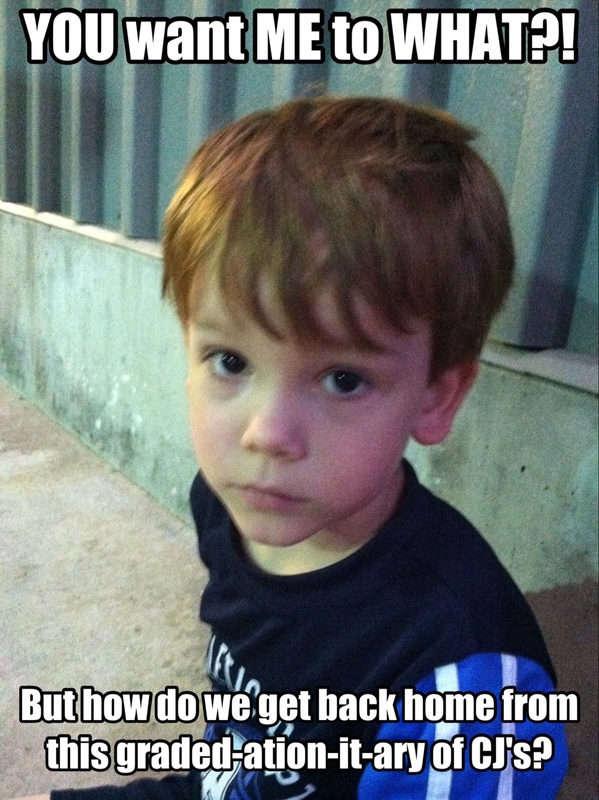 Oh, and please move your feet out of the way if you encounter an overwhelmed preschooler and Mom trying to get out of a stadium before full-out meltdown ensues. Congrats to CJ! We’re so proud and happy for your accomplishments! Wow! You are better than most! I would have “accidently” stomped on his toe with my heels and landed my elbow in his lap! As a mother of a 4 1/2 year old on the spectrum with sensory issues I have found myself explaining other’s rude, insensitive, and downright mean behavior to my son more often than naught. I’m sure as the autism population increases and ages these individuals will be forced to acknowledge and accept them.